A famous Japanese food manga takes on the "truth about Fukushima." The Japanese manga, Oishinbo (美味しんぼ) is a long-running food manga that has been ongoing since 1983. In his latest chapter that was recently published in the magazine Big Comic Spirits, author Tetsu Kariya depicted the manga protagonist, Shiro Yamaoka, as he returned from a visit to the nuclear-disaster-suffering prefecture when he suddenly has a random nosebleed. After the incident, there is a discussion with another character who says that he, too, has suffered from such unexplained nosebleeds and fatigue, finishing with the comment, "There are a lot of people in Fukushima who suffer from the same symptoms. They just don't talk about it." This depiction managed to stir up the hornet's nest. 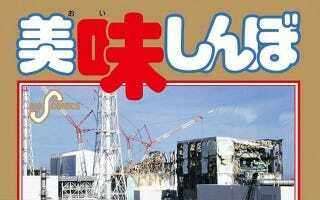 According to Japanese news site Ebisoku, soon after the magazine hit the racks, the publisher, Shogakukan, was flooded with complaints and criticism that the manga was showing Fukushima in an exaggerated negative light. The town of Futaba-machi wrote an official complaint, stating that there was no truth to the claim that "lots of people suffer from nosebleeds and other symptoms" and that the manga was damaging the image of Fukushima that they were trying hard to rebuild. The complaint notes that ever since the manga came out, there have been cancellations of visits and product orders and that Fukushima residents were afraid that the manga was cultivating discrimination against the prefecture and its residents. Shogakukan has responded, saying that the depictions in the manga are based on real-world coverage by the author and that the manga had been published respecting the author's expression. The latest chapter of the manga seems based on personal experience by Kariya that he noted in an interview with Nichigo Press earlier this year. In the interview, Kariya talked of how the damage from the 2011 earthquake and subsequent nuclear disaster was much worse than he had imagined. It was completely different. The worst is the radiation. You can't see it, and it doesn't affect you immediately. But the fact that you can't see it makes it much scarier. This is a personal experience, but after I got back [from Fukushima] and was having dinner, I suddenly started bleeding from my nose, and it wouldn't stop. I thought, "what on Earth?" I've rarely ever had a nosebleed so it was quite a shock. After that, I had nosebleeds at night for days after. But when I went to the hospital, they said "there's currently no medical connection between nosebleeds and radiation" and they severed a capillary in my nose membrane with a laser. Also, after I went [to Fukushima], I felt a great deal of fatigue. The staff who went with me and the chief of Futaba-machi suffered from nosebleeds and fatigue. They say the radiation levels are low so there's no harm, but I wonder about that. In response to the negative criticism against his manga, Kariya stated that while he expected some backlash, the extent of the response has surprised him. In a statement covered by Netarika, Kariya warned that there are still 2 more chapters to come and that he plans on writing harsher things. "People who are in an uproar about a nosebleed might go berserk." Kariya stated. However, Kariya remains firm in his stance, saying that people are trying to sugar-coat the disaster with euphemisms and falsely positive language to hide the truth – something he hates more than anything else. The author of Oishinbo recognizes that a lot of people will not like what he has to say, however, he maintains his position and has said that he will release his rebuttal after the last chapter is published.